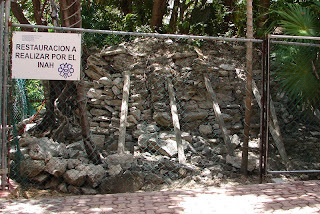 Well I guess it is not unlikely since it is on the coast of Quintana Roo... BUT this structure is however slap dab in the middle of Playa del Carmen's "quinta avenida", which just happens to be the most expensive realestate in mexico... so yea, its a bit of a suprise. 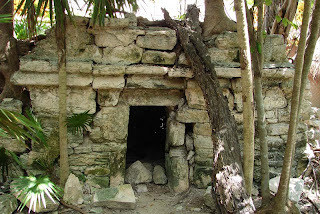 Archaeologists recently restored the facade of this mayan structre, there is not any information at the site, however it seems to date drom the classic period and its arquitecture is consistant with that of many other structures found arround the coast such as tulum. Next time you are in playa make sure you go take a look.